Hollywood royalty: Nova Scotia resident and Oscar-nominated actor Jane Alexander starred in some of the great American films of the 70s and can also be seen in this week’s Dream House. 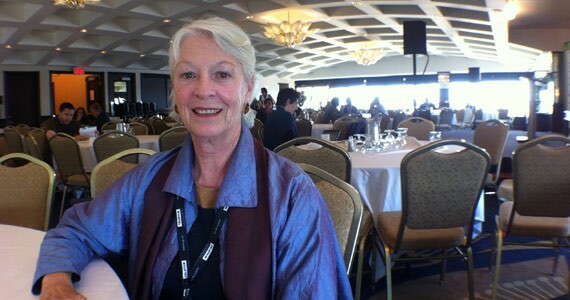 Jane Alexander at this year’s Atlantic Film Festival. That Jane Alexander is well-spoken and thoughtful is no surprise. After a career on stage and in film spanning decades, starring in classics such as The Great White Hope, All the President's Men and Kramer vs. Kramer, her knowledge and communication skills landed her the job of director of the US National Endowment for the Arts in 1994, a position she held for three years. Since then she's continued to act, with roles in The Cider House Rules, The Ring, Terminator: Salvation and this week's Dream House. What is surprising is to find out she's also a Nova Scotia resident. She and her husband, Law & Order producer-director Edwin Sherin, have lived in Lockeport for 14 years. "My mother's family was one of the original settlers of Lunenburg," she says. She visited her grandmother there often when she was a child. "When it came time for my husband and I to flee Nantucket because it was too boutiquey for us, we found Nova Scotia again." She was in Halifax two weeks ago for Strategic Partners, the business conference segment of the Atlantic Film Festival, where we chatted at the Delta hotel. She and Sherin have a production company with a script she's written, a comedy set in Nova Scotia she'd like to see made into a feature film. Alexander is a part of a generation of actors---including Jill Clayburgh, Diane Keaton and Sissy Spacek---who established their credentials in the great Hollywood movies of the 1970s. But does that credibility help when trying to get a feature film made in Canada? "Do I have a cachet? I don't know if it translates at my age anymore," she says. "When I was younger the phone didn't stop ringing for eight years. I was lucky, I had a good window there. It's not the same anymore." That said, she still works regularly ---with a recent role as Queen Elizabeth in the TV movie William & Catherine: A Royal Romance---and she's produced TV movies, so that experience will serve her well. She helped discover the star of a film she made in the 1980s called Square Dance: Winona Ryder was found at an open casting call. What appealed to her about Dream House was the director, Jim Sheridan (In America). "He's the grand old man of Irish theatre and film," says Alexander. "I love him. He took me to the races in Ireland once because he owns all these racehorses. His horse won and I fell in love with him and the horse." She calls Daniel Craig "a doll, a real gentleman to work with." Alexander has fond memories of her other acting partners, including Burt Reynolds and Clint Eastwood in an unjustly maligned comedy action picture she was in, 1984's City Heat. "Oh my god," she says, laughing at my confession of being a fan. "You must be the only one!" She recognizes that aside from veterans like Eastwood, there are fewer great directors working in Hollywood with the freedom and attitude Martin Ritts, Robert Benton and Alan J. Pakula had in the 1970s. "Those were different days. Those were totally actor's directors. If you look at brilliant people like James Cameron, he's interested in the film he's going to make" but less interested in the acting side, she says. "Actors have become more robotic [and] I also find a lot of the indie filmmakers don't know the acting component because they come from a writing or an auteur background."